Most babies take nine months. Some take nine years. Nine years ago, a friend offered to get me into the insurance business. I had an inactive law license, and my kids had just started back to school. It made sense. They would pay for my licensing and get me set up in business. Money coming through the door on my schedule. Sounded like the perfect fit for a recovering attorney/stay-at-home mom. . . . Except for one thing. If I poured my energy into starting an insurance business, I would never write a book. I could live and die happy without ever selling an insurance policy, but I couldn’t live and die happy if I never wrote a book. And so it began. The first draft took 5 1/2 years. Yes, really. I sat in the corner of the coffee shop, playing with my memories of all of the people I knew and wanted to know and telling whatever story they directed me in that day. Plot? Why have plot when you have 78 main characters? Tension? Who needs that? Books are where we go to escape tension, right? I took every night, weekend, and summer vacation off, along with an entire year to care for my mother. Eventually, though, I had what was sure to be the next #1 New York Times best selling novel, not to mention a blockbuster movie starring a younger Kiera Knightley and Ian Somerhalder. All of my family and friends loved it. It would produce the greatest bidding war in publishing history! Then a few rejections started rolling in. What? Couldn’t they see my vision? I swallowed enough of my pride to hire an editor. Enter Kristen Lamb, best selling author, social media jedi, and editor. One of the teachers from my first Dallas/Ft. Worth Writers Conference. When she quit laughing, she called me up and spent five hours telling me exactly what was wrong with my book. I scrapped my “baby” and started over. Page one. Kristen taught me the difference between writing a novel and hanging out with my imaginary friends. Over the course of the next year and a half, I slaughtered 68 of my favorite 78 characters, introduced a wicked antagonist, wrote action that was connected to a plot, and actually had a few people disagreeing with each other along the way. At the same time, also with Kristen’s help, I built a social media platform which connected me with several best selling authors who I now call my friends and mentors. After another, much more successful edit, it was time to polish and market. With all of the upheaval in New York among the Big However-Many-Are-Left-Standing-Today, I wasn’t so sure I even wanted an agent or the traditional model. After all, I had a brilliant publishing attorney, Susan Spann, in my corner. I focused on writing my next book–a spy thriller with my writing partner Jay Holmes. It was enough to let my dystopian thriller shake out as it would. With time and recommendations from Kristen and other new friends, I met up with best selling author and publisher Aaron Patterson of Stonehouse Ink. He chatted with me a bit and decided I wouldn’t be too much of a pain to work with (I hope he still thinks that), so I sent him my manuscript. He welcomed me to the outstanding Stonehouse family of authors. I’m proud to present FIRELANDS. My nine year dystopian thriller baby. She will be delivered by Stonehouse Ink on June 14 at Amazon, and later at other outlets. I hope she will come to mean as much to you as she has to me. I also hope the rest of my babies take nine months or less. My profound thanks to Kristen Lamb for making me her social media guinea pig and writing student. Since we met in 2010, she founded WANA International, which is dedicated to providing instruction and support to help other authors on their paths. I can’t recommend her and WANA highly enough. My thanks, also, to each and every one of you, our readers, for your support in helping me realize this dream. You are the reason. Next week, I’m swimming back upstream to where it all started, the DFW Writers Conference. This time, I will be a teacher. Holmes and I wish you an outstanding week of coming closer to your dreams. I spewed coffee (and contemplated the death of two characters) when I read you had to kill 68 of your favorite 78 characters. Made me wonder how many not-so-favorites bought it in that process. I applaud the fact that you didn’t give up on your dream or that novel. Can. Not. Wait. To. Read. It. Why didn’t I see any “pre-order” linky-love in this post? It also gives me more than a wee bit of comfort to know my abysmal conception to delivery timeline for my current novel is not Guinness World Record fodder. This post comes at a great time in my writing life. It gives me hope. It give me inspiration. If gives me hives. I’ll get to meet you at DFWCon. I may or may not be the wearing a cobalt blue wig when I attend your session, but I will attend. Thanks so much for your support, Gloria. No pre-order since it’s a debut novel and will be out so soon. I’ll be sure to make another announcement on the 14th along with links. I found that once I started killing off characters, I actually enjoyed it. Now, Kristen and I laugh about my original Cecile B. DeMille Cast of Thousands. She has blogged about pretty much everything she’s taught me. I’m going to push her to write a book teaching people to write a novel, or I will write it for WANA. The cover is stunning, Piper! Congrats 🙂 I’ll be grabbing myself a copy as soon as it’s out. Piper, congrats! As you know, I had the privilege of reading an earlier WIP of this – which was fabulous – and cannot wait to read the final version, which I’m sure is even more awesome! (Although I have a Nook, so I’ll have to wait even longer than you Kindle folks…*sad face*). You deserve every accolade, hon, so enjoy being teacher/role model/author/inspiration at DFW! Stonehouse Ink has some great artists and a very picky man with a keen eye at the helm. Thank you. That’s awesome, Piper. Congratulations!!! Have fun in Dallas. I’m so excited for you and your 9-year-old baby! Your post is inspirational to me, as I’ve been battling with a particular novel for about two years yet still really want to finish this book. I think I need to start back at page one as well. When people first start writing, oftentimes they come from a love of writing and others telling them they are good at it, so they assume they can write a novel. Then they figure out that they’re not automatically the next Nora Roberts/Stephen King/J.K. Rowling after all. So they start writing and learning and connecting and rethinking and pushing-a-Sisyphus-sized-boulder-up-a-hill until they’re ready and finally have a published book. Congratulations! Like Kathy, I will have to wait a little until I can get it on my Nook, but I’m looking forward to reading it! Thanks so much, Julie. I really appreciate your support. Congrats on your debut! I couldn’t be more excited for you. I bet you had fun killing off your 70 imaginary friends, but your secret is safe with me! Very inspirational. You give me hope, I am three years into my first attempt. There is always hope! Way to go! I can relate to your journey. I’m at 7 years, and Kristen in in the mix, too. I can’t wait to read your story. Be patient with me. I still need to read Ellie Soderstrom’s book. And K.B. Owen’s mystery. And Patricia Sands’ romance. But you are sooooooo in the queue. I can’t wait for summer. Just finished reading Leanne Shirtliffe’s book — OMG! Hilarious! And it should be out any day! So many great writers; so many great books being born. It ain’t a race, but I’m glad you popped this one out. Finally. Mazel tov! Wow… nine years? Now I don’t feel so bad! I totally hear ya about slaughtering members of the cast of thousands. My earlier drafts had enough characters for a Cecil B. DeMille production. Book plot sounds intriguing. Congrats, Piper! To a peace-loving gal, conflict and tension are really hard. To someone who thought her “baby” was getting a bit long in the tooth (since January 2009), your post is really inspiring. The fact that others have stumbled on “newbie novelist” blunders means that I’m running along on schedule. Piper, you’ve no idea how inspiring this post is to me and I’m beaming right now for you and your book release! I’ve got two years of starting over completely on the same stuff and I’m about to it all again. I know this is time where you learn the most, and it’s wonderful to see how that paid off for you! I can’t wait to get your book! Like, Renee, up there, I’ve got a long list to read, but I’m excited to read each one! Congratulations, friend! So excited to see you this weekend! I wish! But it won’t be out yet. June 14 is the due date. Talk to me, though. I’ll get author copies that I can mail. Piper, I’m so excited for you! There is NOTHING like the thrill of that first book. Sending it out into the world is an act of bravery. May yours be justly rewarded! I can’t wait to read it. Awesome Piper! Super proud of you. TOTALLY deserved. HOORAY!!! I love your cover, and congratulations again (in public this time) on the upcoming release!! A thrilling cover for what sounds like a truly thrilling story. Huge congrats, Piper! Wishing you ever-expanding success! Congrats, Piper!! I think we should have a drink this weekend to celebrate your cover and upcoming release AND Donna’s birthday!! Congrats, Piper! Awesome cover. Looking forward to checking this one out. Nice you’re going to be speaking to others about writing (DFW perfect place for a conference) Enjoy the ride and will be watching for the debut. Awesome, Piper! The cover looks brilliant and the premise is great. AAAAAAAAAnd you have the best recommendation on the cover as well. It’s going to be great, I know it! So excited for you, Piper! Huge congrats to you! Looking forward to reading it when it comes out. Congratulations. I can’t wait to read this! Congratulatoins Piper! From the description, I like the “seeds theme.” Best wishes to you and Holmes in all your endeavors. Congrats, Piper! Have fun at DFW, sorry I won’t be able to attend and hear you speak. Cool! And congratulations! A wonderful outcome, and all best wishes for every success. The moment when that first book appears – it’s always special. So’s the moment when the second and third books are published (etc)…but it;’s never QUITE like the first. Congratulations, Piper! Been following your progress from a distance, and I have to say, this is incredible news. So happy for you! Again, deepest congratulations! Way to go, Piper! Cover looks terrific and I’m putting June 14th on my calender. I’m also inspired by your story. I’ve had a couple rejections come through for my first novel, and am back to the editing process. 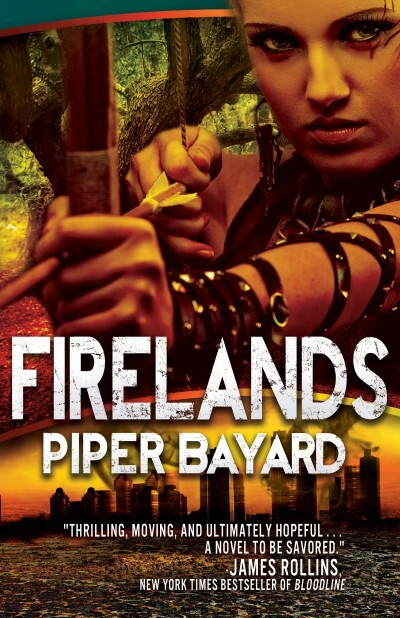 Super, super excited to read Firelands. Congrats on getting James Rollins to blurb! From the deepest part of my heart, I am overjoyed that your new book “Firelands” is coming out in June. Can you believe it is truly happening? Because of your story in this post about the journey of writing your book, I don’t feel as bad that there have been as many obstacles in my life. But like you, at one point I’ll have to ask myself and be honest w/my answer, “Will I be happy if I don’t write this book?” I will have to put my book #1 if I want to complete it. Like others, I cannot wait to read it. The one thing I find myself doing when I read books written by people I know is I ask myself, where do they get the ideas for the plot and characters? What part of the author’s story is in this story? The better I know the person, the easier it is to answer those questions. Once again, congratulations, Piper, and may the road continue to rise up to meet you for as long as it can! Way to go, Piper! You’ve got far more readers than I, yet you still stop in to like my little posts. I appreciate it. I just finished novel number five this month–still looking for that elusive publisher. I’ll be reading yours, though. You can count on it! Thanks so much for the support and encouragement where the book is concerned. I can’t tell you how I appreciate it.